I have talked about our dinner time struggles before. But this is one of those issues that is years in progress. 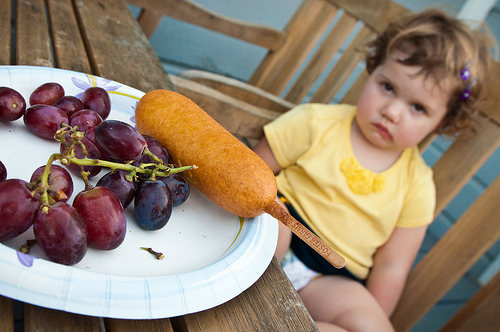 Unlike other phases that last months or even weeks, picky eating can go on. And on. And onnnnn. Meaning, if you plan to stick around this blog, you’ll be hearing me play this sad song for a WHILE. I am trying to take all the advice from all the people and not stress about it. You know, because at least he eats fruit. Or because at least he drinks organic milk. Or that his nuggets are made of actual meat and not “that other stuff”. Still, it would be dishonest for me to say I don’t care that my child battles me almost every single night. It’s a bit of a control thing for both of us and I, as the adult in this situation am trying to let it go. Happy Family is doing a great job of helping parents not only feed more nutritious foods to their children by constantly dreaming up new and healthy snacks, but this year they created some really funny videos to help us all lighten up a bit and look at the brightside. I love this campaign and even just making my own video made me smile! Check it out below and then read about how you can enter to win $20k toward your child’s college education from Happy Family! Learn more about Happy Family’s Brightside Campaign and submit your own story for a chance to win $20,000 for your child’s college education. I suppose one day we will look back on this season and smile. Maybe not because these days were easy, but because these are the days when we were all brand new and learning what matters and what we can let slide. Being a parent is a tricky business. I’ve found it works better when we don’t take ourselves too seriously! I’d love to hear your meal time war stories! Did your food taste like hair too? *This post is sponsored by Happy Family. All opinions are my own. Thanks for reading! It can be so frustrating but in the end, we still have it so good you know? Thanks for reading! Often with us, well for my oldest the youngest is only just turning two and starting this rule, if you don’t want to eat your meal, that’s fine, but you don’t get other things until the next designated meal. I am understanding with odd things; like when I made pot roast and there were tomatoes that looked really weird and were really squishy (though they LOVE raw tomatoes) so I let her have a snack after dinner without eating it. Also I enforce that you are NOT allowed to say something is gross or you don’t like it, unless you have tried it, otherwise it is a lie. If you want to say you don’t like it, you have to try it.